Estuaries, watersheds, river systems, and drainage basins are fundamental to understanding the history of habitation here. Essex county watersheds include the Charles River basin on the south and the Merrimack River, Salmon Falls-Piscataqua River basins on the north, and the watersheds of the rivers that empty into Ipswich Bay. Pawtucket occupied these watershed areas as well as the Merrimack’s tributaries in New Hampshire and in the Worcester and Middlesex counties to the west. 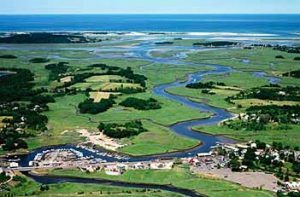 Estuaries—where the outflows of rivers and streams mix with salt water in ocean tides—are the spawning grounds or nurseries for many species of fish and shellfish. 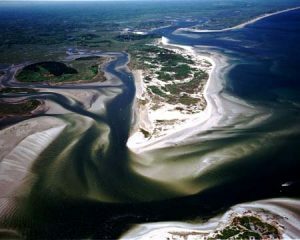 It may be less well known that estuaries also are optimal bioregions supporting the development of agriculture, because the abundant resources of that environment reduce the risk of engaging in food production.3 The supply and diversity of year-round food resources in an estuary can ensure people’s survival in case of crop failure. At the same time, because of the diversity and abundance of food at hand, people living on the estuaries did not specialize in food production. 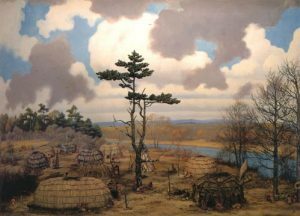 More than inland people, such as the Iroquoians, who came to depend on maize for their living, the coastal Algonquians retained a mixed economy.4 They made their living by hunting, gathering, fishing, clam digging, trapping, fowling, and farming. Year-round readily accessible supply of food. Deep-sea & anadromous fish (mackerel, bass, sturgeon, salmon, haddock, herring, swordfish); shellfish (quahogs, oysters, clams, mussels); and eels. Land & sea fowl (turkey, ducks, Great Auk, Canada Goose); marine mammals (harbor seal, porpoise, whale); small and large game (hare, otter, beaver, deer, bear, raccoon, fisher, porcupine, squirrel, etc.). Salt marsh, fresh marsh, and abundant fresh water. Forests and meadows for wood, bark, fibers, firewood, acorns, groundnuts, chestnuts, black walnuts, beechnuts, sassafras, herbs, plums, strawberries, blueberries, cranberries, blackberries, gooseberries, and mushrooms. Tidal rivers, bays, and beaches for marsh grasses, cattails, sumac, wild rice, clay deposits, shellfish beds, wampum shells, canoe access, and trade routes. Fertile riverine soils and intervales in the uplands for cultivation of corn, squashes, melons, beans, tobacco, Jerusalem artichokes, sunflowers, and other plants. Partly submerged terrace on an outflow plain at the junction of 2 or more tidal rivers. Less than an 8-degree slope. Within 1,000 ft. of fresh water. Southwest-facing intervales of stratified, undisturbed, fertile soil. Abundant nearby sources of fuel. North-facing soft earth overlooking water, for burial grounds. Rock outcrops for wind and sea protection, defensive positions, and astronomical reckoning. Seasonal Migration: Set nets and plant corn. Reap corn & seafood surpluses: Preserve, cache, and trade the surpluses. Increase population size, stability, & density through secure food supply. Increase production commensurate with increased population, with mobile farming to compensate for corn’s depletion of nitrogen in the soil. Settle year-round in permanent villages with mobile farming and seasonal resource procurement. Maintain mixed economy with staple crop cultivation. Pawtucket farms and farming villages on Cape Ann were not permanent in the way that Eurasian Neolithic villages were, which led to the building of the world’s first cities. Without irrigation or extensive fertilization, Algonquian cornfields had to be moved around within an area to find fresh soil. To this end the Pawtucket practiced slash and burn or swidden agriculture—burning down forest, making cornhills among the ashes of the trees, and moving their villages as needed to be nearer to their crops.8 Villages thus were mobile, such that one map may show a given village at one site while another map made at a later time may show the same village at another site a mile or so away. Algonquian agriculture is describe in more detail in Chapter 14. Old corn hills preserved in new-growth forest on the fringes of the Praying Indian village of Wamesit (Lowell), last abandoned in the 1700s. For more information on the allocation of land and resources on the basis of kinship, see, for example: Speck, Frank G. 1915. The family hunting band as the basis of Algonkian social organization. American Anthropologist 17: 289-305; and Stewart-Smith, David. 1994. The Pennacook Lands and Relations: An Ethnography. The New Hampshire Archaeologist 33/34. 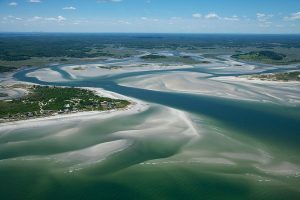 The best sources of information about river drainage systems on the Atlantic coast are the websites of the United States Environmental Protection Agency (Our Waters, Wetlands, Watershed) and the U.S. Geological Survey (Interactive GIS Mapping Website for Major Drainage Basins in Massachusetts; National Geologic Map Database for Cape Ann). For a perspective on the relationship between river drainage and settlement patterns, see James Bradley’s 2007 article, PaleoIndian Sites and Finds in the Lower Merrimac River Drainage (Bulletin of the Massachusetts Archaeological Society 68 (1): 12-20); the Climate Change Institute’s PaleoIndian Mobility and Aggregation Patterns; William Ritchie and Robert Funk’s Aboriginal settlement patterns in the Northeast (1973); Bruce Bourke’s 1973 article, Aboriginal Settlement and Subsistence on the Maine Coast (Man in the Northeast, No. 4: 3-20); and James Petersen and Ellen Cowie’s 2002 article, From hunter-gatherer camp to agricultural village: Late prehistoric indigenous subsistence and settlement (In Hart and Reith, Northeast Subsistence-Settlement Change A.D. 700-1300). 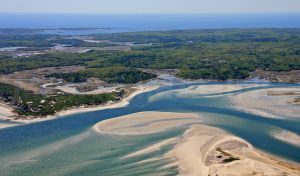 The websites of the U.S. Geological Survey, Environmental Protection Agency, Woods Hole Oceanographic Institution, and Climate Change Institute provide basic information on the historical geology of Essex County, such as the embayment of its rivers and formation of estuaries with salt marshes and barrier beaches. A technical example may be found in Hein et al. 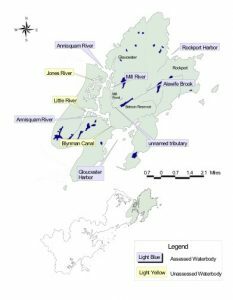 2006 Holocene Sedimentary Evolution of the Merrimack Embayment, Western Gulf of Maine (Merrimack River Geology pdf). William Cronon, in his classic work Changes in the Land describes the significance of estuaries as a bioregion for both native and colonial habitation. 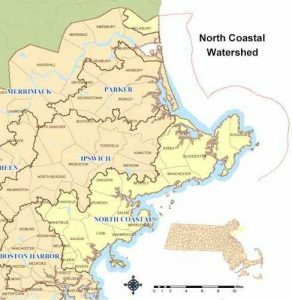 For a local application, see Ed Bell’s 2009 paper, Cultural resources on the New England coast and continental shelf: Research, regulatory, and ethical considerations from a Massachusetts perspective, in Coastal Management 37:17-53. Bennett, M. K. 1955. The food economy of the New England Indians, 1605-1675. Journal of Political Economy 63(5): 369-397. Also Doughty, Christopher E. 2010. The development of agriculture in the Americas: An ecological perspective. Ecosphere 1: 21. Washington, DC: Ecological Society of America. For a perspective on Iroquois specialization in agriculture, see https://theiroquoisstory.weebly.com/iroquois-food-and-agriculture.html. That Native Americans favored estuarine environments because of the abundance and reliability of subsistence resources is well attested in the archaeological literature. See, for example Louis Brennan’s 1979 article, Coastal adaptation in prehistoric New England. American Antiquity 41 (1): 112-113, and an article by Elizabeth Chilton in 2002 (‘Towns they have none’: Diverse subsistence and settlement strategies in Native New England, in J. Hart and C. Reith, eds. Northeast subsistence-settlement change: A.D.700 to A.D. 1700). 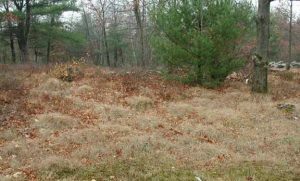 Differences in coastal and inland native settlement patterns in New England are also explained in Curtiss Hoffman’s 1989 article, Figure and ground: The late woodland village problem as seen from the uplands. Bulletin of the Massachusetts Archaeological Society. 50 (1) 24-28. Classic accounts of plant and animal species present in the estuaries of the Northeast appear in Champlain’s accounts and John Smith’s A Description of New England (1616), Edward Winslow’s Mourt’s Relation (1622); William Wood’s New England’s Prospect (1634); Thomas Lechford’s Plain Dealing (1642); Edward Johnson’s Wonder-Working Providence (1654); Ferdinando Gorges’ America Painted to the Life (1659); Samuel Maverick’s A Briefe Description of New England (1660); and John Josselyn’s New England’s Rarities Discovered in birds, beasts, fishes, serpents, and plants of that country (1674). 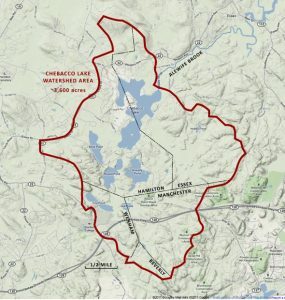 I learned about the locational criteria for the siting of villages in coastal Massachusetts through a talk given by Kerry Lynch, University of Massachusetts Archaeological Services, “Identifying the Submerged Native American History of the Northeast: The Archaeology of Inundated Occupations”. She gave this talk on April 11, 2012 at the Weston Observatory in Weston, MA. Coastal Algonquian trade with Europeans prior to and during exploration and settlement is documented in Kenneth Andrews’ 1984 book. Trade, Plunder, and Settlement: Maritime Enterprise and the Genesis of the British Empire, 1480–1630 and Thomas Nixon’s 2011 book, The North American Fur Trade and its Effects on the Native American Population and the Environment in North America. See also articles by Bruce Bourke and Ruth Whitehead (1985), Tarrentines and the Introduction of European Trade Goods in the Gulf of Maine. Ethnohistory 32 (4): 327-341; and Dean Snow (1976), The Abenaki fur trade in the sixteenth century, The Western Canadian Journal of Anthropology. 6 (1): 3-11. The subject of pre-Columbian and pre-colonial contact is taken up in greater detail in Chapter 4 of this book. Elizabeth Chilton (2010) explores the concept of mobile farming in Mobile farmers and sedentary models: Horticulture and cultural transitions in Late Woodland and contact period New England, in Susan Alt, ed., Ancient Complexities: New Perspectives in Precolumbian North America: 96-103. See also Robert Hasenstab (1999), Fishing, Farming, and Finding the Village Sites: Centering Late Woodland New England Algonquians, in The Archaeological Northeast: 139-153, and Barbara Luedtke (1988), Where are the late woodland villages in eastern Massachusetts? Bulletin of the Massachusetts Archaeological Society. 49 (2) 58-65.